Property Crowdfunding or ‘crowd-to-let’ platforms allow investors to buy shares in a property from just £10. Investors benefit from capital growth and rental income without the hassle of buy-to-let management and with the ability to diversity a lump sum across many properties. Investments can be in both commercial and residential property and can use leverage (mortgages) to increase potential price increases. These companies tend to set up a single ‘SPV’ (Special Purpose Vehicle) as a UK Limited Liability company for every new property asset. The number of property crowdfunding websites has absolutely exploded over the last year. Depending on how public opinion and government regulation responds, we can expect property crowdfunding to revolutionise the UK property market over the next decade. 1.3 What is an SPV? A finder’s fee – often around 5% of the initial deal size. If the property is leveraged 50% this fee will usually be on the total value, not the investable value. An ongoing management fee – often around 15% of rental income. A sales fee – often 15%-25% of the capital increase of the property at the end of the term. As private investors, we’d hope that the additional return from the platform’s expertise and discounted buying prices would offset much of the fees. Also worth considering: if you were managing your own buy to let property portfolio at arm’s length you’d often pay an ongoing management fee of 10%-15% to a local property manager. In this case, they use their property investment experience and cash buyer’s advantage to source a £55,000 property for £41,000 (a 25% discount). They set aside some cash for repairs and unexpected costs, plus their management fees and other charges, which brings it up to £45,500 (still a 17% discount). As I’ll mention in the section on Brexit below, recently platforms have shifted more towards this high yield strategy as concerns grow on the London property market. The property was offered for sale at auction on 3rd December 2014. However, this is a difficult time of year to engage most buyers and the property failed to sell. Suspecting the vendor was motivated to achieve a sale quickly, we made an offer after the auction below guide price and on the basis that we would exchange contracts before Christmas. The timetable slipped slightly to the New Year but we exchanged on 9th January for £435,000. The Chartered Surveyor’s report at purchase stated a Market Value (MV) of £525,000, so the purchase price for the property represented a 17.1% discount. The property is let at £22,800 per annum, a gross yield of 5.2% on the initially discounted purchase price but before all charges and taxes. After all fees and charges the current net yield on this property is just 2.14%, a long way off the 6%+ net yield you see on Property Moose’s typical investments. However, investors in this property have seen massive capital growth. As of September 2016 the latest Surveyor’s valuation values it at £611,107 whilst it’s trading on the secondary market at around £590,000. This shows a capital growth of between 30.5% and 35.2% over a 21 month period for initial investors who bought in at £452,200. This gives an annualised capital growth of around 18%, with 2%+ rents paid as a monthly dividend on top. The future is uncertain for these capital growth gains in the London property market, and Property Partner themselves appear to be diversifying into non-South East investments in the latest offerings. This strategy may continue to work with large infrastructure projects such as HS2 in Birmingham. This is a more recent innovation. There are large property projects that were traditionally only within reach of institutional investors or ‘ultra’ high net worth individuals. Recent examples of this were an £18 million redevelopment of care homes and a £65 million student accommodation portfolio. The property platform may partake in a small percentage of the overall deal, perhaps just 5%, then re-offer this investment to its members. These can be attractive as they may offer higher returns than a traditional property investment by their high barrier to entry. However, they can also be complex and come with higher management fees. Platforms have started offering property loans. These may be to help finance their own property acquisitions or as finance for other business redevelopment projects. Rates are usually around 8%-9%. The House Crowd has many of these loans, and Property Moose have started recently too. In my opinion, you can find higher rates of return on the dedicated secured peer-to-peer lending websites like Saving Stream or Funding Secure who offer returns of 12%+ per annum. Research suggests that traditional real estate investors should hold at least 20 properties to reduce their risk (link to paper). 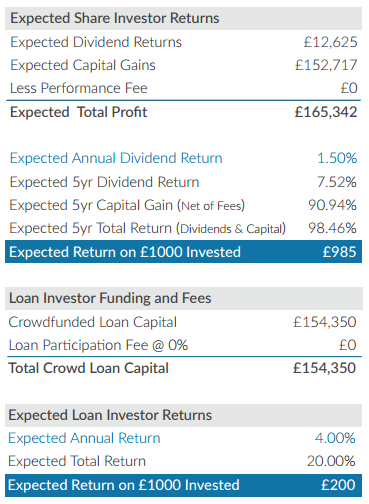 The peer-to-peer lending platform Funding Circle have a great example (here) which illustrates how rates of return distribute more regularly after 100 different loans. Crowd-2-Let platforms let investors easily split their funds across different properties and UK regions. This spreads the risks of vacant lets, unexpected costs and regional housing market downturns. There’s nothing worse than an angry wake-up call from a resident after the boiler’s broken on a chilly February morning. Dealing with local property management companies can have its difficulties too. Investing via a property investment platform gives you peace of mind for a typical 15% ongoing management fee. Taxation: Within an SPV, rental income and capital gains are taxed with corporation tax at 20%. Unlike private renting, interest payments for limited companies are classed as a business expense and so are fully deductible against income. Investors pay further tax depending on their personal circumstances, but the smallest investors are unlikely to breach the tax free £5,000 dividend income limit. Although buy-to-let investors adding additional properties to their portfolio could now choose to do so via an SPV, this would incur additional administration/accountancy fees. In the near future, if the government follows through on plans to cut corporation tax to between 15% and 17% as soon as 2020 this will further reduce the tax paid on capital gains for properties sold after (many run for 5 year terms). An SPV, or Special Purpose Vehicle, is a UK limited company that is set up to manage the property assets. Following the March 2016 budget, as from April 2016 purchases of a second residential property in England, Northern Ireland or Wales are subject to an additional 3% Stamp Duty Land Tax (“SDLT”). In the case of companies and non-individuals (such as our SPVs) first purchases of such properties are also subject to the additional 3% Stamp Duty Land Tax. There are no exemptions. However, if we are acquiring more than 6 units we also have an option to elect SDLT for non residential and mixed use land and property rates. This typically applies to commercial property but can be adopted for residential property in certain circumstances i.e. if purchasing more than 6 units in a transaction. Many property sites suggest expected net rates of return of 10%. Performance management fees on the eventual sale of the property. Buying/Selling fees on secondary markets. Stamp Duty Reserve tax, a 0.5% tax on cost on purchasing shares on secondary markets. Platforms use either a ‘first come first served’ model where a new investment is listed on a pre-announced date, then investors buy portions of the investment until it is fully funded. A second funding model is to have a set period for pre-bidding. At the end of the period, for example one week, all the bids are scaled back if the offer is oversubscribed. Following the Brexit vote confidence in the UK property market was put to test. Open-ended property funds were the first major casualty, with many halting withdrawals and rushing to sell off some of their investments to raise cash. 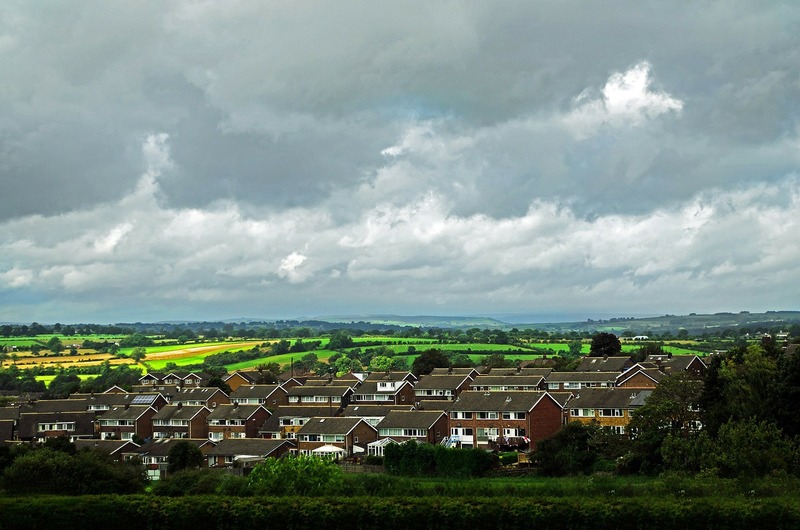 In the months since then, the apocalypse has not yet struck property markets and there is some hope that a housing market downturn can be avoided. Recent data from the RICS residential market survey suggests price growth across most of the UK, but the future is less optimistic for London. 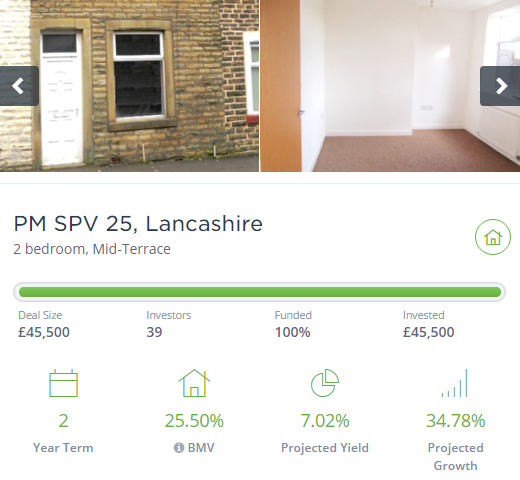 Since Brexit, property crowdfunding platforms that traditionally focused on London and the South East have started listing more Northern and Midlands properties. Dropping interest rates may open the doors for further house price growth across the UK. However, mortgage availability is still tight for many. A stamp duty surcharge of 3% over the standard rate of stamp duty. The staged removal of mortgage interest relief. Between April 2017 and 2020 the government is phasing the reducing the maximum level of mortgage interest relief for private landlords down to 20%. For higher rate tax payers, this would could significantly reduce their net income. Basic rate payers may also find themselves being pushed into the higher rate tax bands due to the way income tax bands will be calculated. To understand these changes better, here’s a fantastic worked example from London & Country. A third smaller change is the way HMRC treats ‘wear and tear’ expenses. Previously buy-to-let owners could deduct a flat 10% of rental income to pay for general costs, but now they can only submit actual expenses for replaced furnishings. These changes are forcing buy-to-let investors to reassess their investment options. As the changes sink in, we may see less interest from traditional BTL’ers in increasing their portfolios – especially if the 3% stamp duty surcharge is added next April. This space could be filled by crowd-to-let platforms who can maximise their tax advantages. Currently higher liquidity to sell at par on secondary markets – most property crowdfunding sites don’t even have a secondary market. Shorter term turn around: typically 6 months as opposed to 2-5 years. Higher expected rates of return: some peer-to-peer lenders which make many property loans advertise expected rates of 11% or more (e.g. Funding Secure, Saving Stream). Avoids some taxation like stamp duty. Different treatment of taxation: interest income from lending has a limit of £1,000 tax free per year before being taxed at your marginal rate. Property Crowdfunding has a higher dividend income limit of £5,000 tax free per year before being taxed at your marginal rate. A different treatment in the case of the platform itself going under. Direct share ownership of the underlying property SPV may make it easier for investors to recover funds. Lending can be more complicated with different batches of loans made with first, second, third charges on the underlying property itself. In these cases a default with on an overvalued property could mean those with lowest priority get nothing. Minimum Investment Amount: £50 on new properties, none on secondary market purchases. 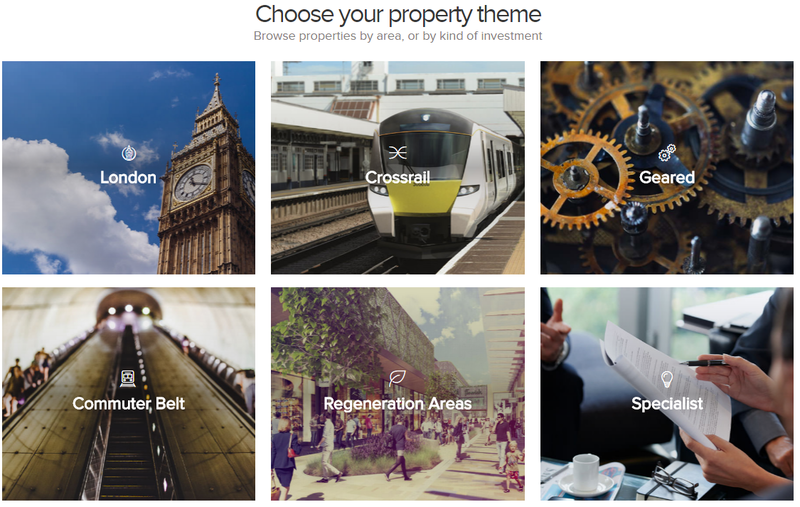 Property Partner is the largest UK property crowdfunding platform. It’s open to investments from both limited companies and non UK residents. – 5% fundraising fee which includes sourcing the property and SPV accounting costs. The House Crowd is one of the largest crowd-to-let platforms. Many people first noticed this when the founder appeared on Dragon’s Den. They offer a selection of deals both in property equity and also lending products. @p2p_blog Not at the moment. We are currently developing our site, we will let you know as soon as it is ready. Thank you. Performance fees vary according to the category of investment. Category 1 – Tenant ready buy to let investments do not incur performance fees. 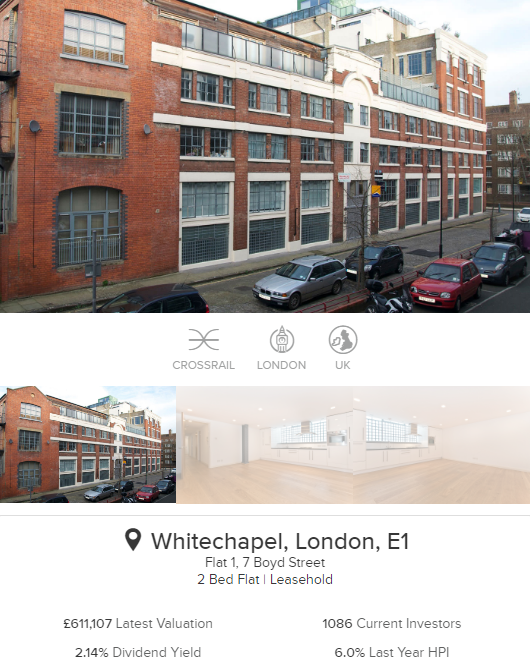 Category 2 – Refurbishment buy to let investments incur a 15% performance fee and a 30% outperformance fee. Category 3 – Development investments incur a 50% performance fee. Performance fees are a percentage of the difference between the sale price (at the point of exiting the investment) and the total (initial) project costs. Total project costs are the purchase price of the property plus all related transaction costs, including any refurbishment and development costs, if applicable. An outperformance fee is a higher commission charge where the investment outperforms the average property within its postcode. 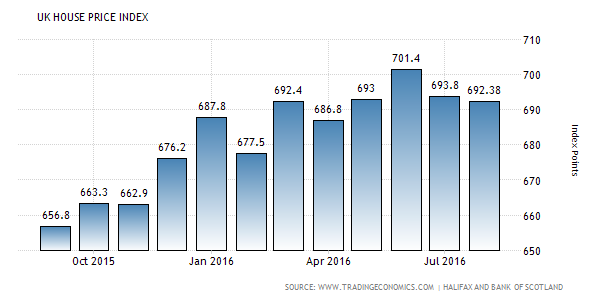 We assess this by reference to the House Price Index (HPI). If the HPI is 5% per annum and the investment value increases by 10% per annum, then we will have outperformed the market by 5%. The commission charge increases to 30% on the outperformance only. Fees: No fees on rental income but some fee (not clear) is charged on capital gains on sale. When you look on the ‘Our Investment Opportunities‘ page there only appears to be a single investment. This is a Southampton luxury student property investment for just over £1,000,000. However, this appears to be the same property investment from June 2014 that pops up whenever I search for Property Crowd in Google. On the other hand, their Twitter and Facebook accounts are being regularly updated so it’s hard to tell if they’re still going. Notable for: Business Insider recently named the founder as one of the ‘coolest people in UK FinTech‘. These are resources such as forums, blogs or research papers that I’ve found interesting and are worth a look. P2PIndependentForum. This is a general P2x investment forum but has sub-forums for Property Moose and Property Partner (link to subforum). Property Partner Investment Discussion Group, a closed Facebook group to protect against spam but open to requests from ‘real’ members (link). Property Tribes. An active forum for UK buy-to-let investors (link to trending posts). GlobalPropertyGuide. Most widely used for investing in foreign properties but also nice as an outsider’s overview to the UK market (link to UK overview). Thanks Paul, always interested to hear about new platforms! I did a little introductory research following through from your link. Are you the same Paul as the founder, Paul Lajszczak or it is a coincidence? I see you have great knowledge about this growing industry, will be perfect to talk at some point. I am impressed by the work and analysis you have put into the posts on this blog, it is a very useful resource that I for one greatly appreciate. Many thanks, keep up the good work and best of luck with your investments! Amazing guide. In this article you can learn more about Crowdfunding.. Cheers to you Neil..